Tennessee Walking Horse great for that walking horse lover! 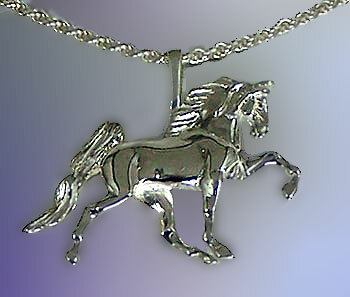 The Gorgeous Horse your number one source for Tennessee Walking horse jewelry. Tennessee Walking Horse in motion, this piece is the perfect gift for the horse lover in your life, or barn. This horse is shown in action which makes it a great piece. Featuring exceptional three dimensional design. Available in 14kt yellow gold, 14kt white gold, or sterling silver. NECKLACE NOT INCLUDED! PICTURED AND PRICED IN STERLING SILVER!